Broadleaf's new Catalog Access Policy module was built with the purpose of providing curated B2B user experiences. The Catalog Access Policy allows users to control what parts of the catalog can be seen and who can see it by using Broadleaf's powerful rules-based engine. As one of the principle engineers working on this project, I am very excited to share use cases for this module, and how you could use this feature within your eCommerce website. We discovered a demand, mostly in the B2B area of eCommerce, for the ability to control which parts of the catalog are visible for different accounts or users. For instance, we may have an account, X.Y.Z. Corporation, who only wants to purchase t-shirts, but our website contains t-shirts, hot sauces, gift cards, and other types of products. Rather than giving customers for X.Y.Z. Corporation access to the entire catalog, it might be best to only show them products that are t-shirts - decreasing the chances of purchasing the wrong type of product and removing the need to sift through a bunch of inapplicable products. In the past, this functionality required writing many lines of custom code and weeks of development to implement. 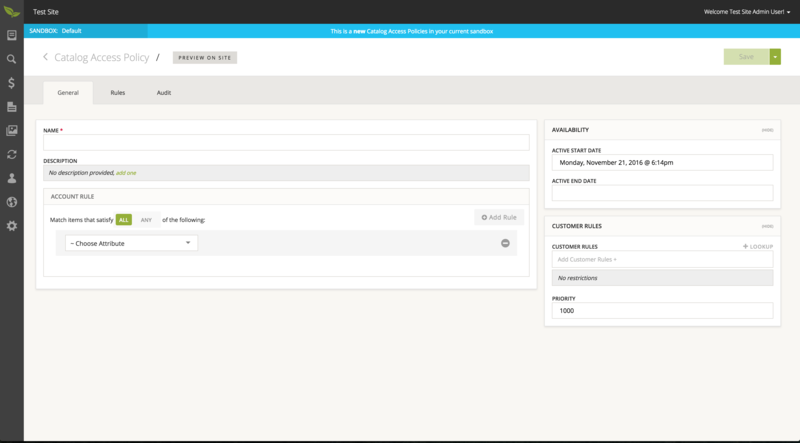 The good news is, the new Catalog Access Policies capabilities were built with the B2B user in mind. Now, once the module is installed, all one has to do is create a new policy and tie that policy to an account or segment of customers. It only takes the addition of one policy in order to ensure X.Y.Z. Corporation only sees t-shirts when shopping on our eCommerce website. We've talked about why you would want a policy, now let's look at our use case we defined above and start digging in on how we can set up a policy to help X.Y.Z. Corporation limit its catalog and improve its user's experience. We need to start by navigating to the Catalog Access Policy section in the Broadleaf Administrative Interface. 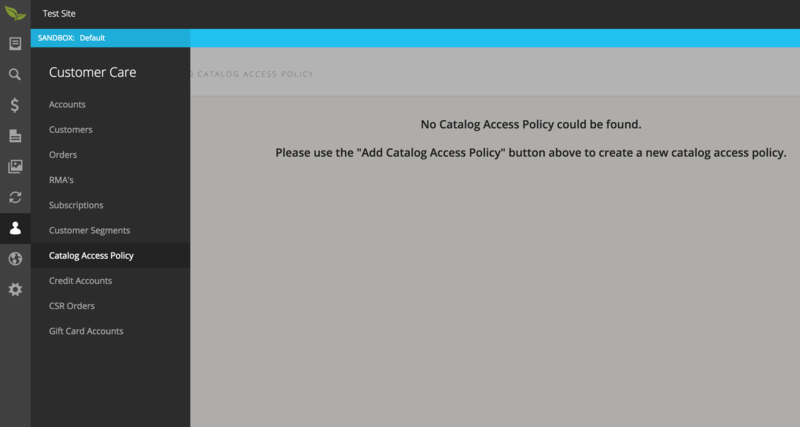 Currently we don't have any policies defined, so our next step is to click "Add Catalog Access Policy" and create a new policy. There is an abundance of metadata one can define for a policy such as: name, description, start/end dates, etc. For this example, we are going to give it a name, "X.Y.Z. Corporation Policy", and then set up some rules. There are two rule-based concepts that make a policy: rules that decide who this policy applies to and then rules that decide what products and categories the user can browse. Let's start off by defining who our rule applies to. To do this, we want to create a new "Account Rule". I have created a rule that specifies this policy applies to accounts with the name "X.Y.Z. Corporation". Now that we have defined who our policy applies to, let's define some rules that govern which parts of the catalog the user can see. To define access rules, we need to go to the Rules tab. We have both Product Attribute and Category rules that we can define. Product Attribute rules are based on Custom Fields defined on Products, while Category rules are rules based on Categories. For this example, we are going to define a rule for the "Product Domain" Custom Field in order to only show Products whose "Product Domain" is "T-Shirt". This rule should do pretty well to ensure that we only see t-shirts, but to be safe, we should add a Category rule to include only the Merchandise category, since this is the only category that includes t-shirts. 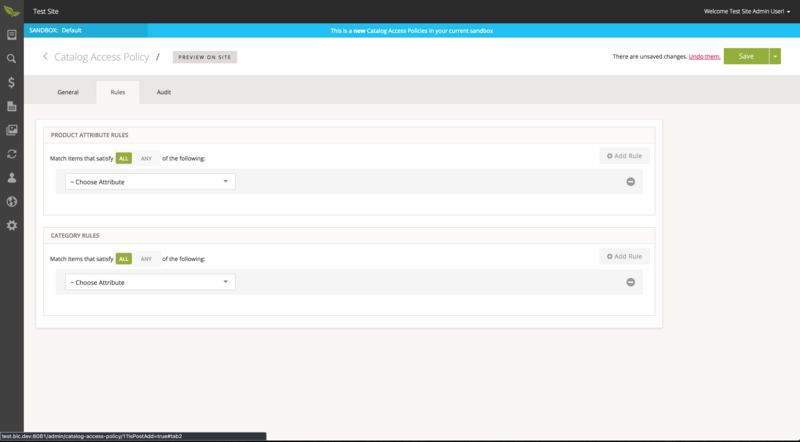 Now, we can save/approve our changes and go check them out on our site. Since this rule is targeting the "X.Y.Z. Corporation", we need to log into one of their accounts. 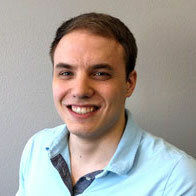 I will log into Bill's account, bill@xyz.com. Bill can now only see the products that are important to his account. The example I gave here is a relatively simple one, but you can make these policies as complicated and verbose as you would like. The Catalog Access Policy module effects are wide-ranging, it touches search, url mapping, menus, checkout, and even the typeahead. It does this through the use of powerful MVEL expressions that are evaluated to determine whether the customer has access to a piece of the catalog. // inject our service bean "blCatalogAccessPolicyService"
Behind the scenes createSolrFiltersForPolicy takes all of the rules you created and converts their MVEL expressions into the appropriate Solr filters. This allows a developer to very easily inject this functionality into your existing search services. 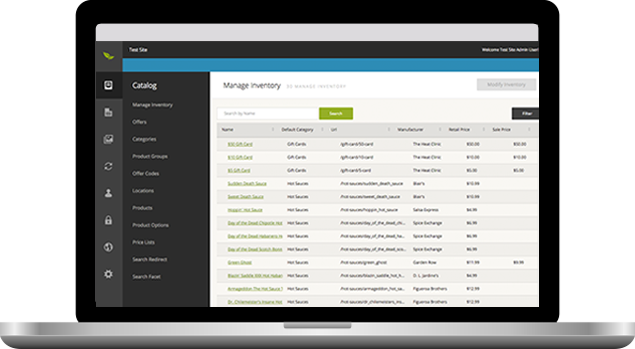 Broadeaf's new Catalog Access Policy module is a powerful tool for B2B eCommerce. I'm excited to see what people do with it and for feedback on how we can expand it further. If you found the concepts in this blog interesting, I am looking to release another blog in the next couple months that explores the power of using MVEL expressions and rule builders to create catered search experiences with Solr.